Learn how Bing Ads can handle bidding for you using bid strategies such as Enhanced CPC, Maximize Clicks, Maximize Conversions, and Target CPA. With bid strategies, you can have Bing Ads manage your bids using our deep analysis of patterns in searches, clicks, and conversions. We can make sure you're bidding effectively, automatically. Whichever bid strategy you use, Bing Ads will always respect your budget limit. How would you like Bing Ads to manage your bids? For search ad and dynamic search ad campaigns, Enhanced CPC is available to all advertisers worldwide. Note that we will only "enhance" your bids when your ads serve in the following countries/regions: Australia, Canada, France, Germany, India, Italy, Netherlands, Spain, Sweden, Switzerland, United Kingdom, and United States. When your ads serve outside of these countries/regions, your manual bids are unaffected. For Bing Shopping Campaigns, Enhanced CPC is available only to advertisers in France, Germany, United Kingdom, and United States. Enhanced CPC (cost per click) is the default bid strategy setting when you create a new campaign. With Enhanced CPC, you set your ad group and keyword bids, and Bing Ads automatically adjusts your bids in real time to increase your chances for a conversion. Your bid will go higher on searches that are more likely to convert and lower on searches less likely to convert (up or down, this change will be made after we apply any bid adjustments you have set). Over the long haul, though, we will try to make sure that your average CPC is not higher than your bid. If you haven't optimized your campaign yet, Enhanced CPC should reduce your cost per conversion and increase your total conversion count while respecting your current budget. For the best results, we strongly recommend using Enhanced CPC in conjunction with conversion tracking (a UET tag and a conversion goal). Enhanced CPC will not break third-party bid-management tools. Enhanced CPC will always use the bids set by your bid management tool as a starting point before applying any adjustment. Maximize Clicks is available only for search ad and Dynamic Search Ad campaigns. With Maximize Clicks, you don't need to set ad group or keyword bids. Bing Ads automatically sets your bids in real time to get as many clicks as possible within your budget. Bing Ads will always respect your overall budget limit, but if you want greater control over your bids while using Maximize Clicks, you can also set a maximum CPC (cost per click). This is an optional limit you can set to make sure that Bing Ads never pays more than a certain amount for each individual click. You cannot change bids for keywords that are using Maximize Clicks. This means that automated rules and third-party bid-management tools will not affect these keywords. With Maximize Clicks, Bing Ads will have full and final control over optimizing your bids. That said, any bid adjustments you have set (or that you set in the future) will be used to inform your Maximize Clicks automated bids. Note that bid adjustments may cause your bid to go higher than your maximum CPC, if you have one set. Maximize Clicks, like all automated bidding bid strategies, will override the Rotate ads more evenly ad rotation setting, and prioritize better-performing ads. In order to use Maximize Conversions, all of your target locations must be within Australia, Canada, France, Germany, United Kingdom, and/or United States. For some customers, available target locations also include Italy, Netherlands, Spain, Sweden, and Switzerland. If you are unable to target these locations at this time, try again later. With Maximize Conversions, you don't need to set ad group or keyword bids. Bing Ads automatically sets your bids in real time to get as many conversions as possible within your budget. Bing Ads will always respect your overall budget limit, but if you want greater control over your bids while using Maximize Conversions, you can also set a maximum CPC (cost per click). This is an optional limit you can set to make sure that Bing Ads never pays more than a certain amount for each individual click. You need to have conversion tracking (a UET tag and a conversion goal) set up — and have had at least 15 conversions in the last 30 days — in order to use the Maximize Conversions bid strategy. If your campaign falls below 15 conversions over any 30-day period, Maximize Conversions will stop optimizing your bids. If this happens with regularity, we recommend switching to a different bid strategy. You cannot change bids for keywords that are using Maximize Conversions. This means that automated rules and third-party bid-management tools will not affect these keywords. With Maximize Conversions, Bing Ads will have full and final control over optimizing your bids. That said, any bid adjustments you have set (or that you set in the future) will be used to inform your Maximize Conversions automated bids. Note that bid adjustments may cause your bid to go higher than your maximum CPC, if you have one set. Maximize Conversions, like all automated bidding bid strategies, will override the Rotate ads more evenly ad rotation setting, and prioritize better-performing ads. In order to use Target CPA, all of your target locations must be within Australia, Canada, France, Germany, United Kingdom, and/or United States. For some customers, available target locations also include Italy, Netherlands, Spain, Sweden, and Switzerland. If you are unable to target these locations at this time, try again later. With Target CPA (cost per acquisition), you don't need to set ad group or keyword bids. You set your budget and your target 30-day average CPA, and Bing Ads automatically sets your bids in real time to get you to this average. Some conversions may cost more than your target and some may cost less, but Bing Ads will try to make sure your average cost per conversion is in line with your target. Bing Ads will always respect your overall budget limit, but if you want greater control over your bids while using Target CPA, you can also set a maximum CPC (cost per click). This is an optional limit you can set to make sure that Bing Ads never pays more than a certain amount for each individual click. You need to have conversion tracking (a UET tag and a conversion goal) set up — and have had at least 15 conversions in the last 30 days — in order to use the Target CPA bid strategy. If your campaign falls below 15 conversions over any 30-day period, Target CPA will stop optimizing your bids. If this happens with regularity, we recommend switching to a different bid strategy. You cannot change bids for keywords that are using Target CPA. This means that automated rules and third-party bid-management tools will not affect these keywords. With Target CPA, Bing Ads will have full and final control over optimizing your bids. That said, any bid adjustments you have set (or that you set in the future) will be used to inform your Target CPA automated bids (while still striving to achieve your Target CPA). Note that bid adjustments may cause your bid to go higher than your maximum CPC, if you have one set. Target CPA is a campaign-level target. Individual ad groups may have different CPAs, and those CPAs may vary over time, while the campaign target CPA is met. Different devices may see different CPAs as well. Target CPA, like all automated bidding bid strategies, will override the Rotate ads more evenly ad rotation setting, and prioritize better-performing ads. With the Manual bid strategy, you set your ad group and keyword bids, and Bing Ads uses these bids every time. Do I set bids myself? Can I use a third-party bid management tool? You set bid strategy at the campaign level. 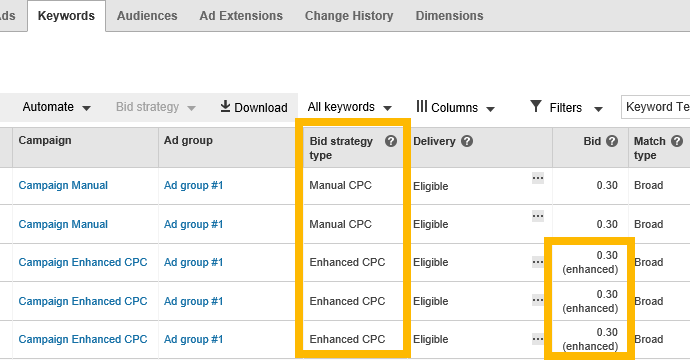 You cannot set a bid strategy at the ad-group level, but you can override a campaign's bid strategy at the ad-group level (see next section). On the Campaigns page, click the Settings tab. Under Bid strategy, select the strategy you want to use. Be patient: A bid strategy needs to run for about two weeks to build up enough data to bid optimally. Changing your bid strategy setting, campaign budget, or conversion settings — or adding or removing ad groups or keywords — will restart this learning period. However, you will see bids start changing automatically within two hours of turning on a bid strategy. Keep in mind that you need to have at least 15 conversions in the past 30 days to turn on Maximize Conversions and Target CPA — we recommend at least 30 conversions. If your campaign falls below 15 conversions over any 30-day period, these bid strategies will stop optimizing your bids. If this happens with regularity, we recommend switching to a different bid strategy. If you want full control for some individual bids, you can override a campaign's bid strategy for any ad group or keyword. On the Campaigns page, click either the Ad Groups tab or the Keywords tab. Select the checkbox next to appropriate ad group or keyword. Under Bid strategy, choose Use the bid I set. Cannot target locations in countries/regions besides Australia, Canada, France, Germany, United Kingdom, and United States. Must have at least 15 days of conversion data. Cannot use a shared budget. Getting set up: 30 days — We recommend having at least 30 conversions in the previous 30 days. For Target CPA, we suggest using your average CPA from this period as your target CPA. Learning period: 2 weeks — Our platform usually needs two weeks to acquaint itself with your campaign. Avoid changing budgets or conversion goals during this period, as this may cause the learning period to start over. We recommend not evaluating the bid strategy's performance based on these two weeks. Run campaign: 2-4 weeks — Let your campaign run for two to four weeks after the learning period (avoiding changing budgets or conversion goals, as this may cause the learning period to start over) and then start evaluating the bid strategy's performance. Conversion delay: 1 week — Keep in mind that conversions may occur up to a week after the associated clicks. Evaluate and adjust: Going forward — Review the campaign's performance since the learning period in aggregate and make adjustments as needed. For Target CPA, we recommend keeping adjustments within 20%, up or down. Timing of conversions:	When conversions occur more than seven days after the associated clicks, it's harder for Maximize Conversions and Target CPA to make effective bids. If most of your conversions occur more than seven days after the associated clicks, we recommend not using Maximize Conversions or Target CPA. Offline conversions: If you don't or can't upload offline conversions on a daily basis, we recommend not using Maximize Conversions or Target CPA. For best results, upload offline conversions within two days of the conversion. Audience Ads: Turning on Maximize Conversions or Target CPA will make your search ads ineligible to be turned into Microsoft Audience Ads. The Bid strategy type column in the table in the Ad Groups or Keywords tab shows you which bid strategy is being used. In addition, in the Bid column, you'll see the name of the bid strategy in parentheses.